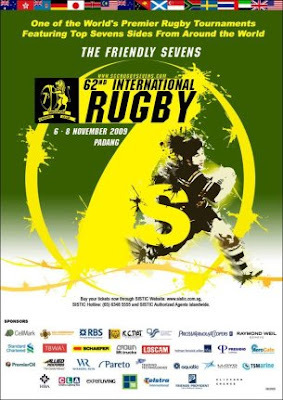 The SCC International Rugby Sevens Tournament is being held at the Padang again this year, on the 6th, 7th and 8th of November. This is always a fun event, with lots of exciting action on the field and even a playground with a bouncy castle to keep the kids happy. We went last year and enjoyed it a lot. There is plenty of covered seating with fans but there is no getting away from the heat of the day. This year the schools and colleges of Singapore will be competing on Friday 6th November from 8am, and the International Women's Rugby Tounament will take place at 5pm. The weekend will be taken up by international teams from Australia, South Africa, Hong Kong, Indonesia, India, Malaysia, Japan. This year The Shophouse Fair will be there if you want to grab some unique gifts, and there will be airbrush tattooing and plenty of food and a flowing bar. Tickets for the whole weekend are SG$25 for adults and SG$10 for kids, available at sistic.com or at the gates on the day.